The Kallokain Photo Loop: Arachnophobia III: You are like an evil Bob Dylan! Arachnophobia III: You are like an evil Bob Dylan! I have gotten a some interesting comments on my recent pictures. I thought it might be fun to share them. "You are like an evil Bob Dylan!" - Tim Mårtensson, my son, and my harshest and most brutally honest critic. "Dude! 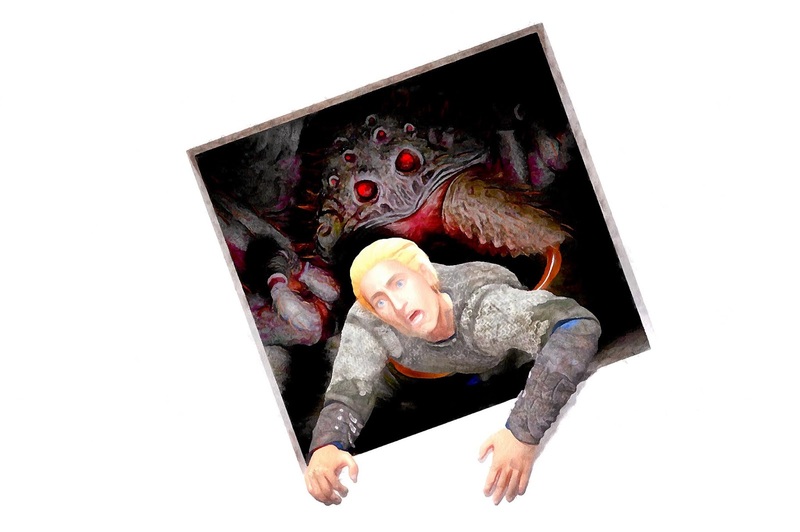 I don't have a clue what kind of childhood experiences you had with spiders, but your series is awesome!" " I'm torn here. These pieces of yours are genuinely unsettling and well-crafted, so I'm happy that great art is being added to the world. On the other hand, SPIDERSPIDERSSPIDERS UGH OH GOD THEY'RE IN MY HAIR THEY'RE IN MY HAIIIIIR"
"The sky didn't need so much texture but apart from that, stunning work." By the way, Barry is right. The sky should have less texture, because the texture distracts a bit from the point-of-interest, the battle with the giant spider. The reason that I haven't fixed it is that I generally prefer to leave a trail of imperfections, and instead try to do better on the next picture. I'll try to remember Barry's point the next time I create a picture with blue skye in it. "Reminds me of the art from early AD&D." "Like it, has a very vintage sci-fi novel cover feel. Awesome!" When I re-read these comments, I realized that what I wrote yesterday about not being sentimental, and not creating sentimental pictures, is wrong. I am very sentimental. It's just that while many other people get sentimental about sunsets, I get sentimental about my friends in my old gaming group, my friends in my old software development team, I get sentimental about the debates we had about Science-Fiction, Fantasy, Horror, and science. "Hahha nice Really fun and exciting image." When I did the analysis of Arachnophobia II, I wrote about how I used guidelines from a 1937 book on photography to create pictures with a broad appeal. So far it seems to be working. I'll return with more arachnophobic pictures soon. You can stay tuned by following my Facebook page, by following me on Google Plus, or by following me on ArtStation.